The densest galaxy in the nearby part of the Universe may have been found. Packed with an extraordinary number of stars, this unusual galaxy is providing astronomers with clues to its intriguing past and how it fits into the galactic evolutionary chain. The galaxy, known as M60-UCD1, is a type of “ultra-compact dwarf galaxy”. It was discovered with NASA’s Hubble Space Telescope and follow-up observations were done with NASA’s Chandra X-ray Observatory and ground-based optical telescopes. Observations from the W. M. Keck Observatory on the summit of Mauna Kea, Hawaii, characterized it as the most luminous known galaxy of its type and one of the most massive, weighing 200 million times more than our Sun. What makes M60-UCD1 so remarkable is that about half of this mass is found within a radius of only about 80 light years. This would make the density of stars about 15,000 times greater than found in Earth’s neighborhood in the Milky Way, meaning that the stars are about 25 times closer. TheSkyNet is celebrating its two year anniversary today with the official launch of a new research project, as well as a range of improvements and new features to make contributing to astronomical research at home more enjoyable, and even easier. Launched on September 13th 2011, theSkyNet is a community computing project dedicated to astronomy, initiated by the International Centre of Radio Astronomy Research (ICRAR) in Perth, Western Australia. By using the idle processing power of thousands of computers connected to the Internet, theSkyNet simulates a powerful single machine and processes data collected by telescopes around the world. Today theSkyNet launches T2 – Transform 2 – a new version of its website that brings new citizen science and membership features. At theskynet.org members can view the credits they’ve earned by processing data, trophies they’ve been awarded as part of their contribution, the actual galaxies they’ve processed data from and can join alliances to process together. 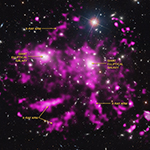 A team of astronomers has discovered enormous arms of hot gas in the Coma cluster of galaxies by using NASA’s Chandra X-ray Observatory and ESA’s XMM-Newton. These features, which span at least half a million light years, provide insight into how the Coma cluster has grown through mergers of smaller groups and clusters of galaxies to become one of the largest structures in the Universe held together by gravity. Located around 6000 light-years from Earth in the constellation of Scorpius (The Scorpion), the nebula formally known as IC 4628 is a huge region filled with gas and clumps of dark dust. These gas clouds are star-forming regions, producing brilliant hot young stars. In visible light, these stars appear as a blue-white colour, but they also emit intense radiation in other parts of the spectrum — most notably in the ultraviolet. It is this ultraviolet light from the stars that causes the gas clouds to glow. This radiation strips electrons from hydrogen atoms, which then later recombine and release energy in the form of light. Each chemical element emits light at characteristic colours when this process occurs, and for hydrogen the predominant colour is red. IC 4628 is an example of an HII region. Scientists at the Max Planck Institute for Extraterrestrial Physics have produced the first detailed three-dimensional map of the stars that form the inner regions of our Milky Way, using publicly available VVV survey data from the science archive facility at ESO. They find a box/peanut shaped bulge with an elongated bar and a prominent X-structure, which had been hinted at in previous studies. This indicates that the Milky Way was originally a pure disk of stars, which then formed a thin bar, before buckling into the box/peanut shape seen today. The new map can be used for more detailed studies of the dynamics and evolution of our Milky Way. Our Sun resides right inside the galactic disk, about 27 000 light-years from the core of our Milky Way. Due to the obscuring effects of dense gas and dust clouds it is therefore difficult to get accurate information about the shape and properties of the inner regions of our galaxy. By using a large number of so-called “red clump” giant stars from the new VVV survey scientists at the Max Planck Institute for Extraterrestrial Physics have now produced a three-dimensional map of the galactic bulge.